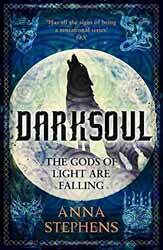 Darksoul: Gods of Light are Falling (2018. 391 pages) is the second fantasy novel, in the Godblind Trilogy, from Anna Stephens, which follows on from her debut novel, Godblind: The Red Gods are Rising (2017). Stephens retains the same structure for this novel, short chapters, with multiple point of view characters. The adult edge of the story is retained in both the use of language and the depiction of violence. Likewise she has rooted her story in the characters relationships and interactions, and the fantasy elements are only introduced in service of the larger human tragedy unfolding. This novel has less sleight of hand when it comes to the plot, but that is not to say that she does not pull a few surprises along the way. Being the middle book in a trilogy, I was expecting more of a second act narrative. Having introduced her characters she would then move them around, positioned for the final confrontation in the third book. But this is not what you get. Stephens has been audaciously ambitious in that the book covers one single siege. It’s a disservice to say that it consists of one long extended battle, but that is exactly what you get. As an idea, this shouldn’t work and it certainly shouldn’t be as compelling as it is, but Stephens uses a deft hand to keep both the action going and your interest engaged. Many of the same characters return from the first book, including Tara, Mace, Dom, Corvus, Rillirin, Crys, The Blessed One, Durdil, Galtas and Gilda, each of whom get multiple chapters as the action switches between the besieged city and the army of Mireces. Interestingly, Stephens has chosen to not directly chronicle the various battles throughout the book in detail, rather the action stays with whichever character you’re following imbuing a greater sense of dangerous claustrophobia, which places you at the heart of the action.